Five years after the Viking village of Berk made peace with the dragons, they now live among the villagers as helpful companions. Hiccup goes on adventures with his dragon, Toothless, as they discover and map unexplored lands and territories. Having come of age, he is being pressed by his father, Stoick the Vast, to succeed him as chieftain, although Hiccup remains unsure if he is ready for this responsibility. While investigating a wildfire, Hiccup and Astrid discover the remains of a fort encased in a colossal blue ice formation and encounter a dragon trapper named Eret, who blames them for the destruction of his fort and attempts to capture their dragons for an insane conqueror named Drago Bludvist. The two riders return to Berk to warn Stoick about the dragon army that Drago is amassing, and Stoick orders the villagers to fortify the island and prepare for battle. Stoick explains that he once met Drago at a gathering of chiefs, where Drago, mocked after offering the chiefs his service in return for their servitude, murders them all, with Stoick as the only survivor. Hiccup, however, refuses to believe that war is inevitable. After Stoick interrupts their plan to get Eret to take them to his master, Hiccup flies off with Toothless in search of Drago, to try to reason with him. They are captured by a dragon rider named Valka, who is revealed to be Hiccup's long-lost mother. She explains that she, like her son, was unable to kill dragons, and so, after being carried off during a dragon raid, she spent twenty years rescuing dragons from Drago's traps and bringing them to an island haven created out of ice by a gigantic Alpha dragon known as the Bewilderbeast, to whom all dragons answer. Stoick tracks Hiccup to the island where he discovers that his wife is still alive. Simultaneously, Astrid and the other riders kidnap Eret to find Drago, but they are also captured and Drago learns of Berk's dragons. 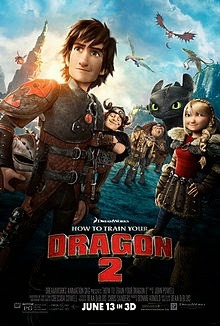 I love dragons so I'll never missed this movie although watching it later, together with Angels which was more meaningful. Overall, an entertaining movie, as usual. The only plot which I can't grasp was the fact that his mother left him 20 years ago yet Hiccup can accept her back in his life easily, so was his father. That part was a little far-fetched for me. I guess the dragons excuse was acceptable. Anyway, truly enjoyable especially watching it with the kids. About: A 2014 American 3D computer-animated action fantasy film produced by DreamWorks Animation and distributed by 20th Century Fox, loosely based on the book series of the same name by Cressida Cowell.